J G Campbell is a small haulage company based in Bedfordshire running 2 tipper trucks and employing 3 drivers. We are contracted hauliers for Tarmac ltd, who are part of the CRH group, the leading sustainable building materials and construction solutions business. By using trucks fitted with Euro 6 engines we have managed to lower our fuel usage, reduced our C02 emissions and lowered our NOx and particulate matter emissions. We first became aware of FORS through Tarmac as it soon became part of the required standard for contracted hauliers. 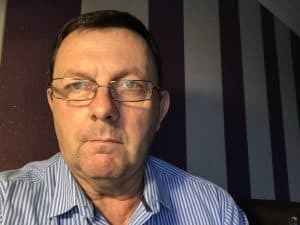 Very early on I realised that adopting the FORS standards and reorganising the way I operated I could run my business in a more professional and organised method. This in turn benefitted my business with reduced running costs and improved safety. I have subsequently purchased a second euro6 truck. Working alongside Tarmac’s on site practitioner I was able to pass my initial FORS bronze audit at the first attempt. I realised then what my business could achieve and was encouraged by Tarmac to go for silver and then Gold. 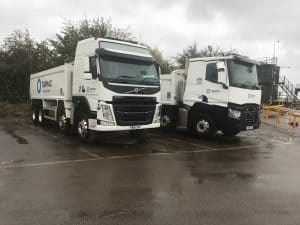 Having achieved bronze we realised that using the various FORS toolkits and in particular the performance management tool we could monitor then begin to lower our fuel usage and consequently our emissions. With the help of FORS training and toolkits we have been able to implement new techniques in order to reduce noise pollution which includes turning off an idling engine when not in use. An idling engine is using diesel and making unnecessary noise. “We found the safe urban driving course a real eye opener.” – Owner operator Jim Campbell. All our drivers are asked to complete a health check list before they start working for us and we ask to be informed of any new health issues. We are part of the recruitment initiative implemented by Tarmac. All our drivers are fully trained before they start work for us. We encourage our drivers to behave in a considerate manner when on the road and on construction sites. A lot of our work is carried out at night under controlled conditions in built up areas so it especially important to make as little noise as possible. We are at the final stage of a supply chain that starts at a quarry and includes rail freight and even ships . We are committed to keeping up to date with new developments in the construction haulage industry but for now we operate euro 6 trucks with up to the minute safety equipment and performance tracking software . Our first year as a Gold accredited haulier was a rewarding experience and our aim is to maintain the same high standard.